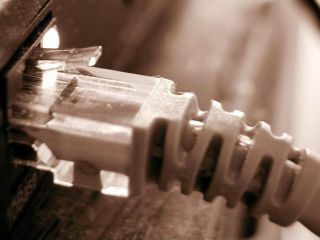 While companies such as Virgin Media are now beginning to roll out fast 50mpbs broadband via fibre-optic cables, the UK-wide fibre-optic network is failing badly according to experts. The consequences of falling behind the rest of the world in installing widespread fast broadband via a UK-wide fibre-optic network could be nothing less than disastrous for the UK economy, according to Professor Christopher Bishop, chief scientist at Microsoft Research Cambridge. Professor Bishop is set to present the Royal Institution Christmas lectures later this week, continuing the tradition launched in 1825 by physicist Michael Faraday (and one of TechRadar's favourite ways to welcome in the new year, providing much-welcome brain fodder after the Christmas week of excess!). The Microsoft man is to call on the UK government to launch an urgent programme to improve the network of fibre-optic cables across the country. "If we are looking for a government project that would stimulate the economy in the short term and help combat the impact of the credit crunch, while also bringing long-lasting improvements to the nation's infrastructure, then we could do no better than rewire the nation with fibre optics," Bishop told The Observer. Bishop continues: "We can now shift huge amounts of data speedily around the country but cannot move it for the last mile into people's houses because there is not enough bandwidth in our domestic telephone cables, the only effective route we have for taking broadband signals into homes and small businesses. He is concerned that the UK's failure to upgrade (particularly in comparison with the Far East) is "beginning to have serious consequences," across all areas of life, impacting in fundamental ways on the future of education, health and business. "There are some really exciting advances in the pipeline - including the development of machines that can see and identify shapes with the sophistication of humans," claims Bishop. "That will bring about all sorts of changes, from development of PCs that can recognise faces reproduced on digital photographs to machines that will be capable of highly complex design work." Bishop's Royal Institution Christmas lectures are also set to include demonstrations of the making of jellyfish ice-cream with liquid nitrogen, the swinging of 14kg metal spheres to within millimetres of his head and a live video link appearance by none other than Bill Gates. Be sure to tune in on Five at 7.15pm from Monday 29 Dec until Friday 2 Jan and check out rigb.org/christmaslectures08 for more info.